I was talking to a grandmother at a playgroup this week (she's very much on my guru list for her brilliant advice) and she mentioned how she had her little two year old grandson buttering his own toast when he had breakfast at hers. He buttered it, ate the lot and asked for more, possibly in part due to the enjoyment of doing this for himself. It really made me think that this is such a simple thing that we can do to improve children's self esteem, eating habits and independence, it is a shame it is yet another thing that gets sidelined when we become too busy. Preparing food together is part of our ethos in raising the boys and we try to involve them in cooking and food preparation whenever possible. The only downside is that it often does take extra time and usually a big dose of patience, but this is seriously outweighed by the benefits. Here's one of our regular lunches to give an idea of what I mean. I chopped vegetables into sticks, spooned out some pitted olives from a jar and put some vegetarian chorizo and 'party eggs' on a chopping board, plus soft cheese in individual bowls. I helped the boys by opening the bread rolls, then they spread the soft cheese themselves and chose what they wanted to put on their rolls. All of the veggie chorizo, the cheese, the peppers and the olives got used up, plus a lot of the carrot and celery sticks. One of the things I love about this lunch is that there is zero waste - the boys are asked to finish what is on their plate before they take more, but they can eat as much as they like. 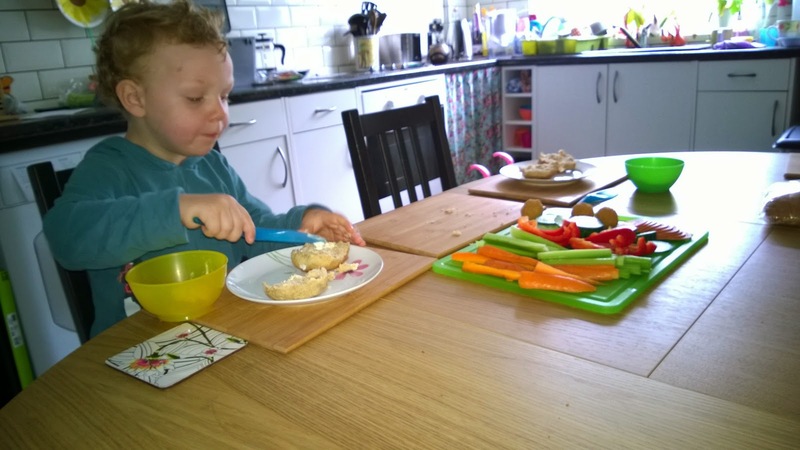 Any left over veggies become snacks during the afternoon that my constantly hungry boys can help themselves to (and me too, which helps to keep the lid firmly on the cookie jar). If we aren't going to eat the left over veg during the afternoon, it goes back in the fridge and will become part of dinner later. 1. Get kids involved in choosing and preparing meals, growing food if you can, letting them pick out veg in the shops, picking a recipe from two or three that you show them or constructing meals for themselves such as home made pizzas. 2. Offer a wide variety of foods - little and often. Let them see you eating a wide variety of healthy food - try to conceal it if there are things you don't like because kids imitate the people around them. We did not talk about why daddy never eats fruit - if the boys gave him a piece of fruit from their plate he would pretend to eat it and then sneak it back onto their plate, there was a ban on saying 'I don't like' we say 'that's not my favourite, but maybe I'll like it next time I try it'. 3. 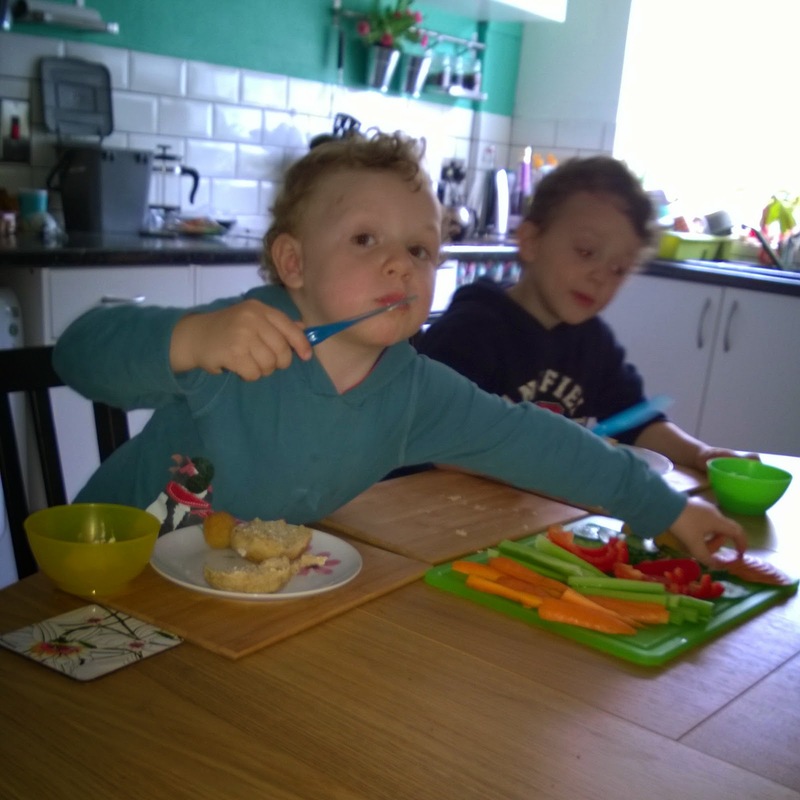 Share the same meal - if you give kids fish fingers and spaghetti hoops for their tea and them cook something different for your own supper you end up doubling the effort, but also raising kids who will seek out sugary pap when they're older. Plus you're a family, not a restaurant. It makes me crazy when people tell me they're cooking four different things every night, because that's when people end up resorting to ready meals from the freezer which are low in essential nutrients and high in fat, sugar and salt. Feeding a young toddler? Aim to cook things that you can just blend up a portion of for them to save time and ensure they're getting well rounded taste buds right from the start. Stick a couple of bowls of blended meals in the fridge for when they're hungry when you haven't had the time or energy to cook yet. The exception is I guess if you have someone with a dietary preference or requirement not shared by the whole family, but even then I would go for trying to cook something nice that suits everyone rather than trying to cater for different people. Before we were vegetarian I would make a veggie meal for everyone if we had a vegetarian guest, rather than making something separate. Likewise if you have a family member with an allergy or intolerance - by eating to their requirements you include them in normal family meals rather than making them feel left out, so they're less likely to rebel and make themselves ill eating the banned foods when they get the chance. 4. Require that children try a bite of each thing at each meal even if they don't like it, but once they've had the bite that's it, don't pester to eat all of it. If they really hate something and won't eat enough dinner to fill them up, they get wholemeal bread and real butter - not exciting enough for them to avoid dinner on purpose for it, but not leaving them hungry either. Trying not to make a big deal out of it helps, although it can be hugely frustrating when they turn their nose up at something they previously loved and that you've spent time and money making. Trying to stay consistent and firm in your approach makes children feel secure - they will keep testing the boundaries but need you to keep those boundaries in place. Consider treating yourself like a child - I'm not a big aubergine fan, but I try it every so often because that's what I expect of my kids. It takes something like 10 to 20 tries of a new food before it becomes accepted, but then a disliked food can become a favourite - I have two small olive addicts now. 5. Keep portions small - if you have a 'clear the plate' approach, start them off with a tiny dinner that they can add to, rather than a mound of food that puts them off. It saves waste as uneaten food left in the pan can be recycled as another meal but the revolting scrapings from a child's plate cannot. You may find that your little ones will eat masses of food stolen from your plate while they ignore the identical food on their own - go with it, at least they're eating. 6. Try to avoid using pudding as a bribe. If you have puddings such as a nice bowl of strawberries and creme fraiche planned, don't use the phrase 'eat up or there's no pudding' unless you actually intend to deny them a pudding. In a cafe I used the 'sit still and eat nicely or there's no ice cream' and then had to sit mortified through Ollie's crying when he didn't comply and I didn't let him have the ice cream. I should have handled it differently and not said that, but having done it I felt I had to be consistent. I was on edge in the presence of an elderly relative and placed unreasonable expectations on my wriggly and excited child. I should have taken the boys to the play park first to run off that energy first, or just not put Ollie in a situation I know he would struggle with as he genuinely can't sit still and wriggles to the point that he regularly falls off chairs. Note: As with anything, each family is different and the ideas above are just what works for us in our situation and are not intended to lecture or judge anyone doing things differently and happy with their choices. I don't get it right at every meal, and sometimes I get frustrated and tired of the constant feeding and clearing up, but it is always worth the effort. I certainly wouldn't swap it for peeling lids off microwave tubs of slop for every meal. Lots of folks are so time-poor it has become a way of life, but it's worth trying to rebel against this modern trend as often as possible. Most of my meals take less than half an hour to prep and cook, far less in many cases, so it's not about spending hours slaving over a stove. It's about eating fresh, eating varied and eating together.